Pistol caliber carbines and subguns for Survival? The TV Series “The Walking Dead” has introduced an entire new generation of people to the legendary Colt Python 357 magnum revolver. While many of the old timers blame the TV show for yet another peak in price, the truth is these guns have always been expensive and wont get any cheaper any time soon… and maybe that’s one of the best reasons to own one. Personally, I’ve been into firearms since I was a kid, heck, not even a teen yet. I would see those ads in gun magazines and sure enough there was the Colt Python. The finest revolver ever made. The best looking one in my eyes. Years went by, guns came and went and the Python eluded me. At first way out of my price range, then money going to other things, others guns that I felt I had more of a need for, but eventually I got myself the beautiful 6” stainless steel snake you see here. Still with “The Walking Dead” in mind I set out looking for a rig for my new snake. I got a nice belt on ebay but turns out the holster used in the Tv series is actually for a 4” gun. It seems the props guys just cut the bottom and they felt having the barrel stick out wasn’t that big a deal, maybe added to the zombie theme or maybe displayed the gun more. I’ll be damn if I have 2” of my gun sticking out, no way! Fortunately enough, at about the same time I got an email from Luke over at craftholsters.com offering to try out one of their holsters. Sure enough I found exactly what I needed at their website. 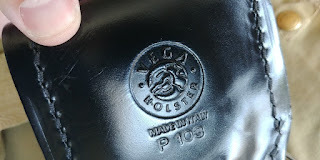 Nice Italian made, black genuine leather holster covering the entire muzzle as its supposed to. 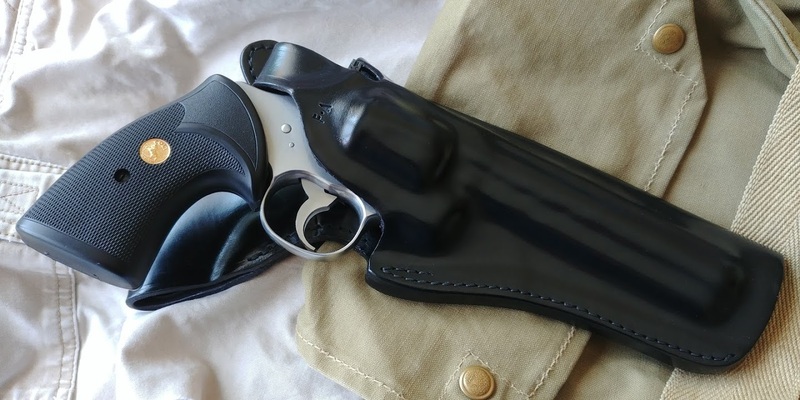 The holster is well made and the website is comprehensive yet easy to navigate to find just what you’re looking for. Shout out to them and keep them in mind if you’re in need of a holster. So why get one, or not? I wont bore you with a history lesson here. 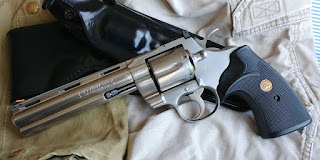 The Colt Python was introduced in 1955, the same year Smith and Wesson was taking up the limelight with its Model 29, "the most powerful handgun in the world". The Python was intended to be Colt’s “top-of-the-line” revolver, with considerable hand fitting going into each gun. It succeeded at that. The Python trigger an accuracy are in its own league, with more hours going into master gunsmiths tuning and fitting each gun than any other gun at that time. Why wouldn’t you want to own one then? Well, price obviously is an issue. They aren’t making them anymore and over at gunbroker prices start at well over one grand, even more for nickel plated and stainless steel guns. While very well made and accurate, a Python isnt exactly a workhorse gun. Its more of a sports car than a truck. Even if it is a premium firearm, it needs to be cared for with certain regularity by a knowledgeable smith that knows how to work with Colts and there aren’t many of those around. A defensive use gun? A Glock is far superior at a fraction of the price. If you need a revolver, a good S&W is just as good for defensive duty, tougher and again, way cheaper. Ok, got that out of the way so why buy one then? As expensive as it is, its still a 6 shot 357 magnum revolver, one of the finest ever made at that. For years they were proudly carried by police officers and it did serve them well. While not my first choice, you can do a lot worse than having a Colt Python in your night table! At a time there was a Colt Python Hunter, targeting the outdoors market. If you have sharp eyes this is one of the most accurate revolvers ever made and more than up to the task of hunting. With good loads ranging from hot magnums to light 38 specials you have a broad spectrum from small to deer-sized game. The Python is also a favourite among target shooters. The Colt Python is capable in all of these roles but so are other guns and a fraction of the price, what can it do that other guns cant? How about be an all-time classic, the “The Cadillac Of Revolvers”? Whatever you pay for one, chances are you’ll be able to sell it for as much and then some in the next few years. Few firearms will do that for you. There’s guns you buy new and a decade down the road you sell for less and theres other like the Python that retain if not increase in value. 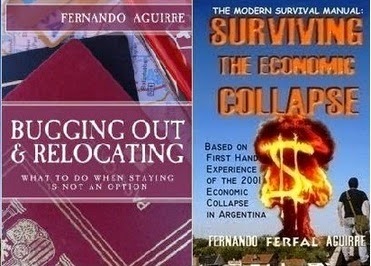 When I left Argentina I had to sell some of my guns. Kept a fair share but parted with a few too. The money came in handy and let me tell you, it was better to make money than to lose money when selling guns when it came down to it. Not that different from a precious metal stash kept for a rainy day. If that rainy day ever comes you want the most cash for whatever it is you’re selling. Even if you are not into “investment” guns, there’s also the heirloom quality of the thing to consider. I often read people commenting on guns they inherited or some fine firearm they will inherit some day. Its nice to know your children will have something of superior quality to remember you by and maybe pass it down the family to future generations. Finally, maybe the most important reason to own a gun like this: Because you can. Owning one of your “grail guns” is a darn nice. The Colt Python has the sweetest trigger. You can appreciate the legendary craftsmanship all over. It’s a pleasure to shoot the gun, even to just hold and stare at it for a while. From a survival perspective it would seem that the strongest case for a gun like this is a financial one, but personally, I believe that the simple pleasure in ownership is its strongest point. I've posted before about the terrible situation white farmers and white people in general are going through in South Africa. Its simple genocide folks, people being killed because of the color of their skin, systematically murdered by those in power. Make the time and do watch this video, you owe it to yourself. Tons of valuable information regarding how a tyrannical government goes about slaughtering part of its population. People, just a reminder. A post to put things back into perspective. Things like these, it’s a daily occurrence in places like Buenos Aires. I’ve been living in that reality for more years than I care for. You know what we didn’t talk about with like-minded people? How can I carry a smaller gun with less ammo. That’s the kind of thing discussed by first worlders, people that down deep don’t think they will ever need a gun. your take on this Mr. Aguirre? Many will say a pistol caliber carbine or sub gun is just a big gun firing an underpowered cartridge. That may be true, then again, no one ever accused a 22LR carbine, (long arm, underpowered) of not being useful. While some will see it as a waste and say that rifles should fire rifle rounds, I believe that a pistol caliber carbine or subgun is particularly useful from a survival and preparedness perspective. Ammo logistics is the most obvious advantage. In the wild west days carbines and revolvers shooting the same cartridge was a a particularly popular combo. Just one round to stock and carry, feeding both guns. The same holds true today. 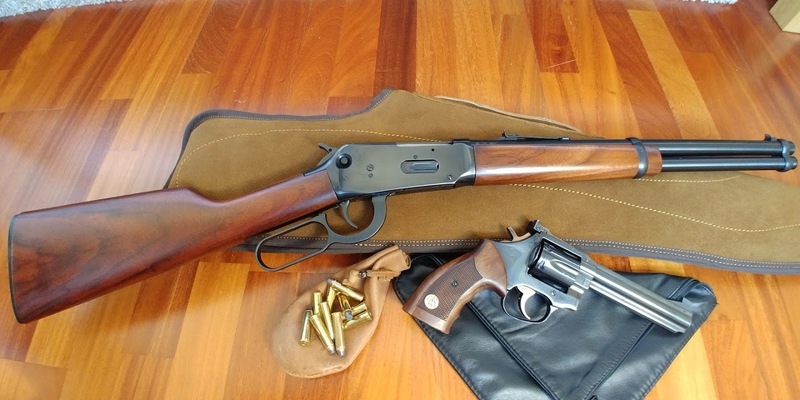 My Winchester trapper 94 in 357 magnum is a handy little carbine. Its accurate and packs a punch, digesting hot 357 magnums and 38 special LRN alike. The revolver runs on the same ammo and gives you a handy tool for close up work. The same logic applies to a 9mm carbine or sub gun. The possibility of using a sound suppressor sure is a plus if you have one. If you can have both guns running on the same mags its even better. I’m fond of the KPOS –Ronin conversion kits that use Glock pistols. 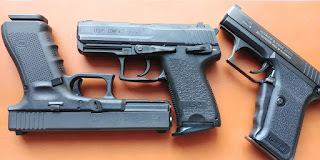 You can basically put one Glock in it and get the advantages of a stock and easy optics installed, and have the exact same weapon as your sidearm with 100% compatibility in ammo, magazines and even the gun itself. Just a big bulky Glock? Sure, but that stock and foregrip means those 25 to 50 meter shots are MUCH easier and faster to make. If you don’t have a nice stockpile of rice and lentils by now, you haven’t been listening. You should look into sorting that out as soon as possible. I’ve posted over the years about how rice and lentils can keep you not only fed but healthy. You don’t need much more than that really. It’s not only enough, its actually some of the healthiest food you can eat. This brings me to this video I wanted to share with you folks and why a plant based diet is so important. The health benefits have been proven ad nauseam. Soy bean boy and vegan joke aside, this is a survivalism website. If CVD and some of the most common causes of early death can be fought with a specific diet, then that’s our business too. Take the time and watch it. Better yet my friend, give that stockpile of rice and lentils a go, think of it as a test run for SHTF. 30 days of rice, lentils and pasta with a good bit of fresh fruits and vegetables. Maybe a tiny tin of tuna if you get bored in the mix. They have been around for a while but if you haven’t looked into installing a home security camera, you really should. Having an alarm is a great idea and you should have one installed, no doubt. Also hardening you home with a good front door, locks, etc. But no matter what you do, the truth is that with enough time (and it usually takes them surprisingly little) any criminal can break into your home. 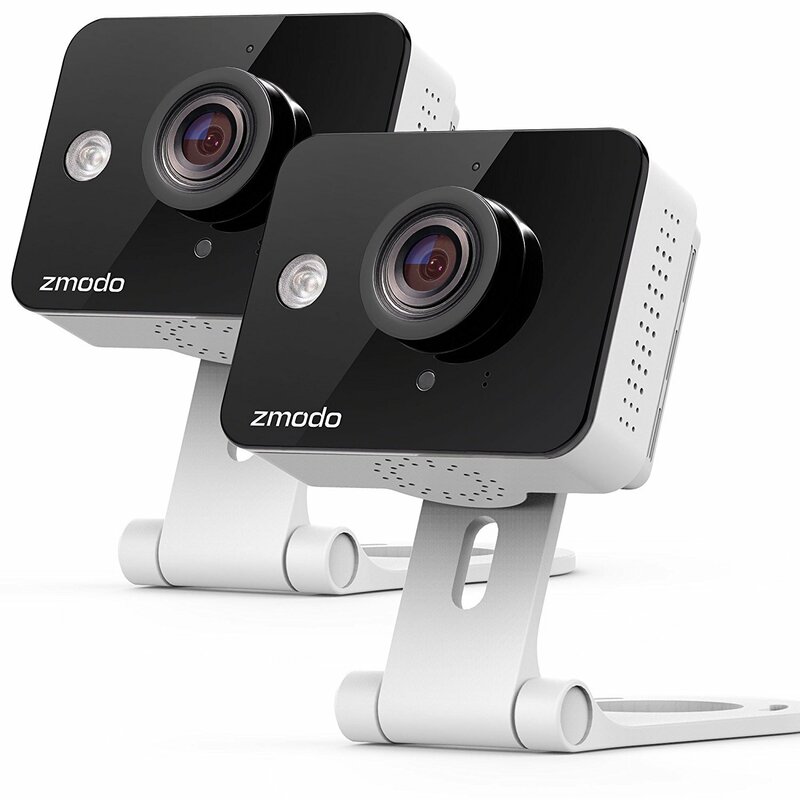 Wifi security cameras are worth their weight in gold. Not only can they notify you with their motion detection feature that someone broke in, you can also check to see whats going on inside your house while you are away. You can set it up so that is notifies you to your cellphone, sends a picture or video of whatever triggered the alarm or even listen and speak through it to whoever is inside. 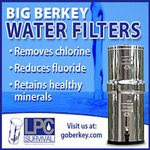 They are a must have for your home and for any property that is left vacant during extended periods of time. Maybe the best thing about these cameras is not just letting you know someone broke in so that you can call the police, even describe the burglars, but that it allows you to capture images of them for future identification. 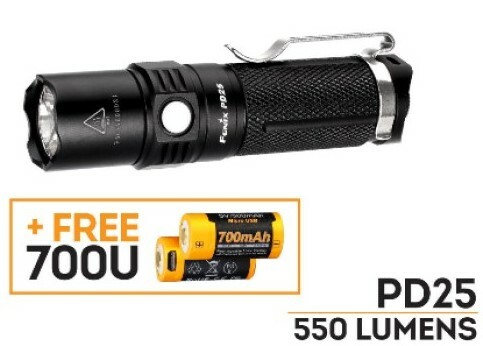 This one is the #1 seller, has top reviews in Amazon and should do fine, but look around for other models in case something else fits your needs better. That’s all guys. Just a very high value tool in case you don’t have one already. Not a lot of money and in general they are pretty simple and fast to install and set up with your phone. We have traded notes on this before…. I have read someplace a semantic distinction between the two, but if something as simple and common sense as a safety is left off a semiautomatic pistol, why try to make a distinction between accidental and negligent? Of course, if the pistol user then does not engage the safety when it is on the gun, that is an actual act of negligence on his or her part, just as leaving the pistol where unauthorized people might get their hands on it is negligent. I suspect that people who like pistols that do not include a manual safety like the fact that it is “ready to fire” instantaneously when they draw the weapon. That suggests that maybe they anticipate being in some kind of “quick draw” shootout! But can anyone point to instances where the amount of time it might take to disengage a safety made the difference between winning and losing a gunfight? *By the way, the inclusion of what some call a “trigger safety” in a design is not really a safety, it is merely a bit more trigger to be pulled before the pistol discharges. Thanks for your email. You touch upon some of the most important and maybe most misunderstood concepts regarding armed self-defense. On gun designs and safeties, these three pistols, none of them have a manual safety. The HK USP Compact 9mm is set to decocker only from the factory, this is how it’s issued to several police and military across Europe (notice the spurred hammer, unlike the American version with the bobbed hammer). The P7 features a built-in cocking lever located at the front of the grip which is automatically pressed when you grip the gun. These three are all excellent fighting guns, arguably some of the best ever made. What they all have in common? All three will fire if there’s a round in the chamber. There’s no manual safety to mess things up. Regarding the difference between negligence and accidental discharge. By definition negligence means “failure to exercise the care that a reasonably prudent person would exercise in like circumstances”. Accident on the other hand is “an unforeseen and unplanned event or circumstance” or “lack of intention or necessity”. A person playing with a gun, pointing it at people’s faces and saying “don’t worry, its not loaded”. That’s negligence. A person shooting with someone downrange, also negligence, no matter how good of a shot you think you are. Basically negligence would be a willful disregard for basic gun safety rules. You know you are doing something wrong yet you choose to do it anyway. An accident on the other hand is what happens in spite of your best efforts to be safe. This, this can happen to anyone. Shooting a quick follow up shot without the intention of doing so because of a poor grip, finger tension and/or recoil. Pulling the trigger on a gun, believing it to be empty when in fact its not. These would all fall under understandable human error. Why is it important to tell the difference? Because negligence simply isn’t acceptable, period. But an accident, that can happen to anyone no matter how careful you are. If we believe that all accidental discharges are negligence then we are tempted to believe that ourselves, not being negligent people, are immune to accidental discharges also. Not true. If you shoot enough, sooner or later you will make a mistake, or something will fail, or you will get distracted, or you’ll swear you emptied that gun even if you completely forgot you chambered a round right after safety checking. The difference is that accidents will rarely involve breaking all safety rules at the same time, and even though you may unintentionally break one, as long as one of them remains a tragedy can be avoided. As for safeties, I believe that today there’s no need for them, at least not in modern fighting autos. In fact I believe they create a false sense of security trusting the safety. God knows theres been plenty of tragedies involving guns with manual safeties. Technically speaking they did have an important role in early auto pistols when guns such as the 1911 or Browning Hi Power were single action only, or because guns lacked better safety mechanisms and could fire accidentally if dropped or knocked. Keep in mind that no one ever accused a revolver of needing a safety. You may think “oh! But that long DA trigger pull in the revolver is safer…”. Well, my Manurhin MR73 is probably the finest combat revolver ever made and it has a rather short and crisp double action, perfect for a combat gun. Anything that would get caught in the trigger of a Glock and cause an AD would likely do so in a MR73 as well, or any finely tuned S&W or Colt with a good trigger job. At the end of the day after studying accidents year after year what I have learned is that guns shoot when someone pulls the trigger in one way or another. Most often it as simple as that. Sometimes defective gear (a bad holster) or poor safety practices (carrying a gun loose in a purse, or appendix carry in my opinion) can cause accidents to be more likely. A tshirt gets caught in the trigger and bending over a gun carried AIWB puts enough pressure to cause it to fire, for example. I know of an AD involving a Glock and a leather holster that had deformed in such a way that the lip of the holster caught the trigger of the Glock as it was being reholstered. At the end of the day, theres still a trigger being pulled. The same would have happened with a revolver. Regarding your last question I can say yes! Safeties do kill people all the time! I’m reading a Spanish book about police shootings called “En la Linea de Fuego: La Realidad de los Enfrentamientos Armados” (In the Line of Fire: The Reality of Gun Fights) . The book studies several officer-involved shootings in detail. You would be surprised by how often trained police officers forget to disengage the safety or forget to chamber a round. In many of these incidents they did have to draw as quick as possible, often doing so when already being shot at, more often than not it seems shooting single handed. There’s a youtube channel called Active Self Protection. They show footage of actual gun fights caught in video. There you see that this happens all the time. Gunfights start in fractions of a second, often catching the victim by surprise. People forget safeties, forget they have empty chambers and they often shoot one handed, sometimes keeping the attacker away with the other. Have not chatted with you in awhile so after viewing your volcano info thought I would say Hey. I live in the shadow of Mt. St. Helens and Mt. Rainier in WA state. Volcano country. Of course I am more concerned about earthquake here where we are told it is only a matter of time, not if, The Big One hits. It is constantly amazing to me to see the vast majority of the population continually reminded of the potential threat of natural disaster but they shrug their shoulders and look the other way. I’ve concluded that it is just too much for the average person to grasp the threat and include responsible preparation into their lives. Just too overwhelming to cope with the thought that “it could happen to me”. It is human nature I suppose. Some people will argue with a Stop sign. Other people don’t bother to recognize a Stop sign. Many folks just believe in the back of their mind, if anything terrible should happen, help will be on the way. Those are the ones. Those are the victims. There are always survivors and there are always victims. So many people by nature just seem to find comfort in allowing themselves to nestle down into the comfort zone of “it won’t happen to me”, and if it does, rescuers will save me. To those who believe that I say, good luck. The first video clip is mind blowing. Trying to imagine the lava spewing hour after hour, 24/7 is something I have trouble comprehending. Hello Pete, Thanks for sharing your experience. Indeed the power of nature is humbling. All things considered we’re less than ants in the surface of the planet. More like microbes... a relatively minor movement of land and for us it could be a disaster of biblical proportions. You’re right about denial being a power tool. It’s the same mentality that allows people to get by in ridiculously dangerous cities where crime is off the charts, shrugging it away with a “oh, this happens everywhere” mentality (no, it doesn’t) . That same mentality applies to people that live in areas where they have been warned time and again that a large scale earthquake isn’t just likely, but practically unavoidable in an amazingly short period of time, yet they make no preparations for it whatsoever. What happens if it hits? What happens if your home is destroyed? What happens if your home is spared but the place you live in becomes a disaster area? What if you all happen to be separated when it hits? Where do you all agree to meet? Where will you go if you can’t stay home anymore? How will you get there? Do you have fuel to cover said distance? What if your car is damaged/destroyed? These are all questions that should be answered by a comprehensive plan, covering most likely scenarios and contingencies. Oh, it was just a few days ago when I posted about this. 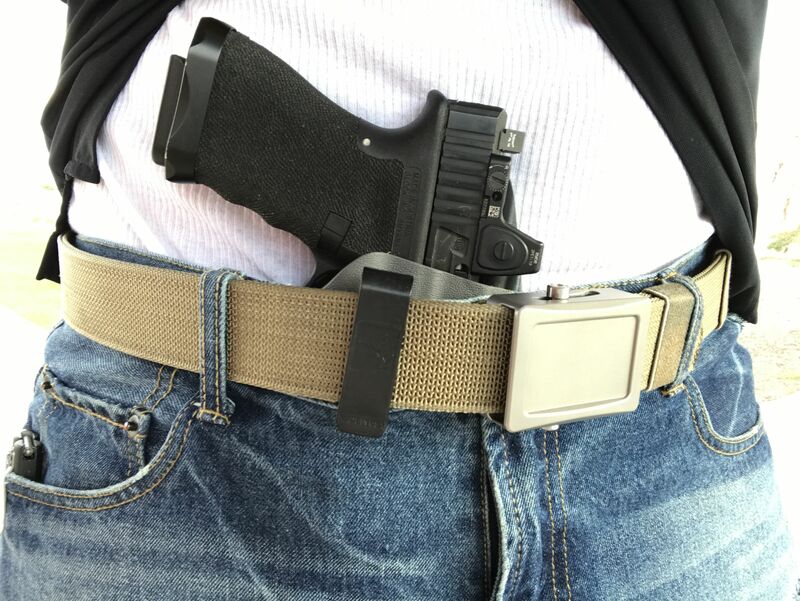 Check out this new accident with AIWB carry posted over at The Truth about guns. Guys, its would be so easy to take the “personal preference” “do what works best for you” stance but I cant. I have to be honest and in all honesty I believe appendix carry is a terrible idea. Sure, nothing is supposed to happen “when done right”, its supposed to be perfectly safe but guess what? People keep getting shot in the groin while carrying that way. Why? Well my dear friends, because at the end of the day nothing, not even appendix carry, is perfect. When it comes to guns, If you are not planning for a worst case scenario when it comes to safety then you’re a walking tragedy waiting to happen. Shoot enough and you’ll see people have not only negligent discharges but accidental discharges as well. No negligence involved, just human error. When that gun fires, when you hear a bang when you’re not supposed to, where do you want that gun to be pointing at? Guatemala Volcano kills over 60 people: Why you should prepare too even if you dont have one nearby. Man, you go years without one and then all of a sudden you have Hawaii and now Guatemala in just a few days. This is what you do if you prepare as you should folks. Serious risk assessment. Got a volcano nearby? You have to prepare for it. You DONT have one nearby? Doesnt matter! Even if hundreds or even thousands of miles away a volcano can affect your land, poison your water, kill your crops and cattle and just create havoc in the are affected by the ash plume. Check out the ash plume caused by Chaitén volcano in 2008 in Chile. That’s Argentina to the right, all the way to the Atlantic coast. Have a contingency plan, your vehicle kit ready, a bug out location that isnt downwind from your residence and quality respirators for each family member. Check out some of the lessons from the Calbuco Volcano Eruption.